Rosary | ARISE! LET US BE GOING! Right after that, it was off to Charlotte to see the Bishop and the other priests of the diocese. The bishop offers his priests an Advent meal of fraternity each year out of his own pocket. Very pleasant. I gave out the handmade Rosaries for priests, and the Bishop took one with much appreciation, asking about those who made them. I said that I had a few left and that if he knew of any priests who might appreciate them he could have those too. He said he did, and it seems we had just the exact number needed for this region of the world. So, I was quite happy with that. Thanks to the makers of the unbreakable rosaries! 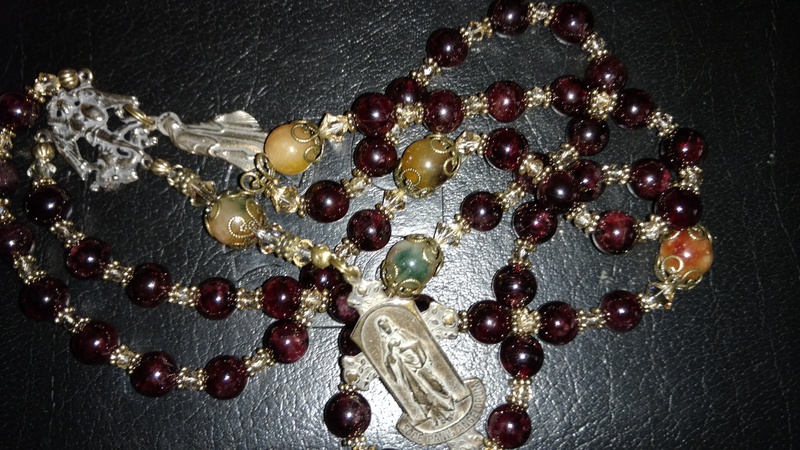 A number of makers of unbreakable rosaries have sent in unbreakable rosaries. There are smaller versions and bigger versions. I’m clutzy so I like the big ones. Unbreakable is a necessity for me. All I do is break breakable rosaries, so these are great. Comments are moderated. I won’t let comments through on this post. If you’re a priest and would like an unbreakable rosary, just put your name and address in a comment and I’ll get it sent out to you forthwith. One is spoken for already (but I don’t have the address yet). Let me know which one you would like. Also let me know if you’re easy about it and would be happy with any of these. These were made with love to assist our priests. Thanks to our rosary makers! I need verification from any member of the U.S. Army as to the veracity of the assertion for the skulls. I’m thinking skulls are not used. He says he heard this said while he himself was a Boy Scout way back in the day. Meanwhile, we wouldn’t want anyone to have the idea that one is pelagianistically pacing one’s journey to heaven because of saying prayers. We don’t acquire heaven. Salvation is a gift. We are drawn into true prayer by the grace of Jesus at Mary’s intercession. Meanwhile, I have no problem with calling to mind our demise because of sin. It’s helpful to have a humble and contrite heart while thinking of the goodness and kindness of Jesus and Mary, neither of whom knew the corruption of the tomb though incomparably they knew the pain of death. We thank them. Unbreakable rosaries for priests made. Better than military rosaries imnsho. As the doer of knots[!] tells me, it may take some time for them to make it across the pond. I have to wonder if such weapons of spiritual warfare will have to be carefully examined and pondered in customs, or if I’ll have to go some federal agency to answer questions as to their use. It’s hard to disguise them for easy transport. The priest who asked about such knotted rosaries that are quite impossible to break will have to tell me which one he likes best. Update: He’s says he’s partial to the Pardon Crucifix. Of course! 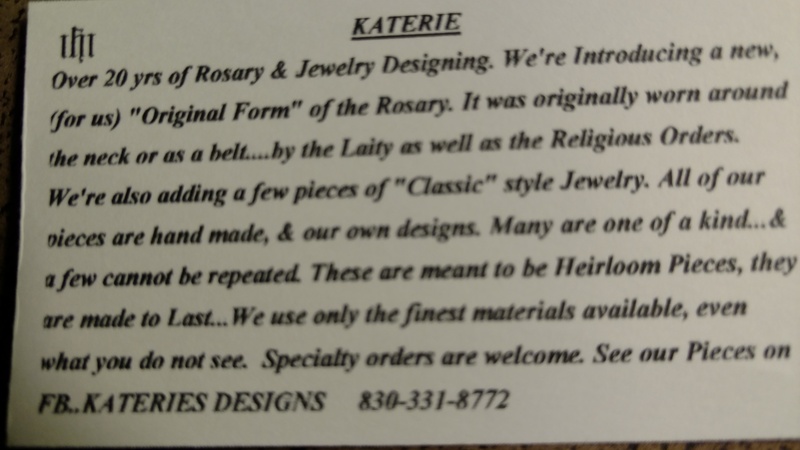 Knotted nylon rosaries for priests? Update: Encouragement for priests! This was made for me by a seminarian at a seminary where I was teaching a while back. 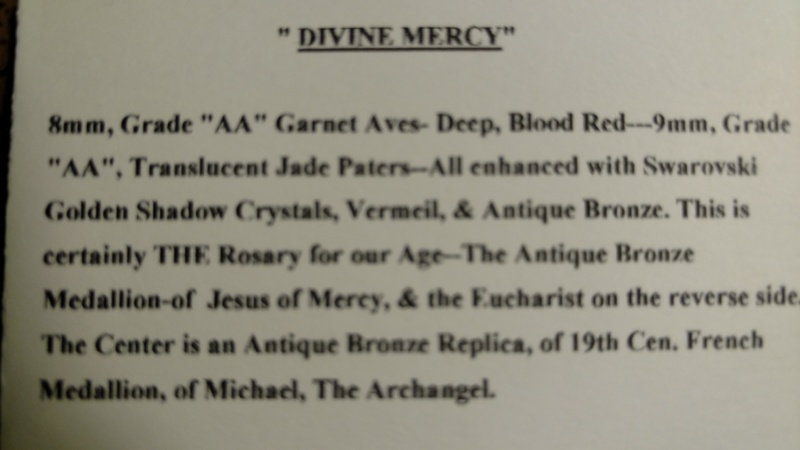 He added the miraculous medal. He’s now a priest after the Heart of our Lord. I added the medal of Saint Benedict (gift from a cloistered Benedictine nun who prays for me). I really like unbreakable rosaries as I’ve broken all other “unbreakable” rosaries. Also, I guess it’s the nylon, it doesn’t twist up into unknottable knots. Perhaps it carries the blessing of Our Lady Undoer of Knots. Anyway, I love everything about it. To the point: A priest friend noted my EDC mention of this rosary and wondered where he could get one. I’m going to be brave and ask if anyone knows how to make such things and wouldn’t mind making such a rosary for a priest. Note the color! Note that the “Our Father” knots about twice as many twists as the “Hail Mary” knots. Don’t worry about medals. Priests know how to add their favorite medals or crucifixes. Update: We have a promise of a rosary or even a few coming up in a few days. This is great encouragement for us priests from the laity. This is much needed these days. So, thanks especially for that. In fact, this is what I’m sensing: the Holy Spirit is firing up the Mystical Body of Christ, more Mass attendance, more Adoration, more Confession, more personal support and encouragement. All priests thus encouraged are most thankful. It used to be when I was a seminarian and a young priest that I would come up with wildly academic ever so cerebral meditations on the mysteries of the Rosary, reading the relative Scripture passages in Greek and Hebrew and letting all this race through my mind as the Hail Mary prayers were playing, as it were, as it is sometimes said, a symphony in the background. Why not put the facts of the mysteries together with the recitation of the Hail Mary into the background just a bit, the mysteries still visible, as it were, the words of each Hail Mary still recognized, but putting an emphasis on Jesus and Mary right here, right now, as they are in heaven and as they are with us, thanking them for what they did for us back in the day whilst upon this earth, but, mind you, thanking them right here, right now. Prayer once again. And the Rosary flies by. Goodness! What happened? Reality. Much better, that. This is from Kathleen Riney. Her husband is in hospice now. In your charity please say a prayer for him and for her. She’s a great prayer supporter for all our priests including Father Gordon MacRae and myself. A reader wanted me to upload an mp3, a recitation of the Rosary, but instead I would like to give you a peek at what I do with some of my time while driving the great distances in my parish. I chant the rosary. In the mp3 below, the Ave is chanted in Hebrew with a chant I made up while driving along. שלום לך, מרים, מלאת החסד, אדוני עמך, ברוכה את בנשים וברוך פרי בטנך, ישוע. מרים הקדושה, אם האלהים,התפללי בעדנו, החוטאים, עתה ובשעת מותנו. אמן.